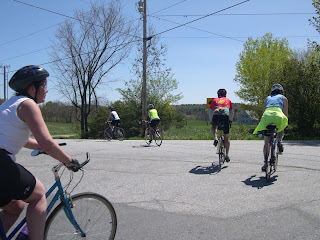 We had a gorgeous day for a bike ride last Saturday in Wayne - cool and dry, bright sunshine, clear skies, little wind. 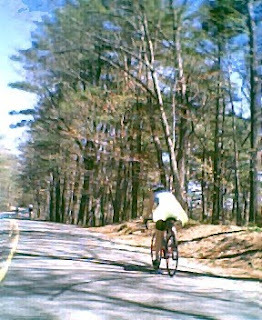 Frank took us out along some scenic back roads along the shore of Pocasset Pond. We headed north to Fayette, passing by the "round cemetery" where there lie Wings, not Celts. 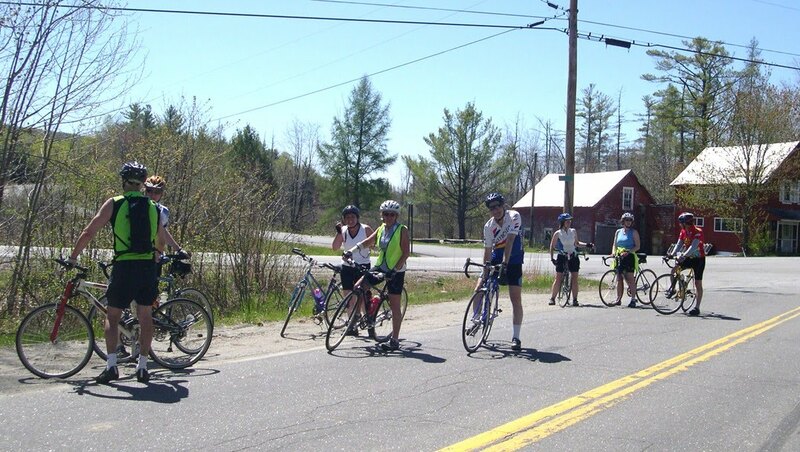 After a spin down Route 17, we headed north again, towards Chesterville, along the ridge of the famed Chesterville Esker, a geologic formation seemingly tailor-made for cycling. A beautiful flat (!) stretch of road follows the ridge of a prehistoric sand bar left by a melting glacier eons ago. 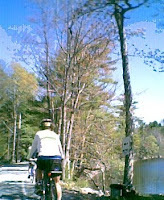 At points, the terrain drops off sharply to pristine small lakes on either side of the tree-lined route. The natural beauty is marred only by a gravel-pit operation, which served as our turn-around point. We could have gone on and on, but our return route lay in the opposite direction. We will return to the Esker later in the season, as it is a special run through all four seasons (yes, even when plowed in mid-winter!). On the return route, Frank took us on some more pleasant back roads towards Livermore. We stopped to regroup at most intersections and turns, as usual, but the emerging black flies kept these interludes short. 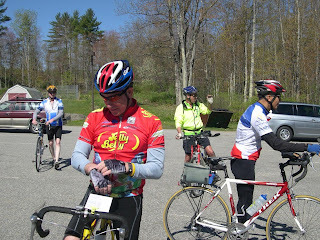 We gathered again for a stop at Pike's Oasis, and then headed toward Leeds. Here the local pastoralists must have missed my memo about manure spreaders, as we were treated to a magnificent roadside display. Undaunted, we pressed on to Wayne, where a stop at the waterfall by Tubby's Ice Cream beckoned. It was a great day to be out on a bike with a great group. 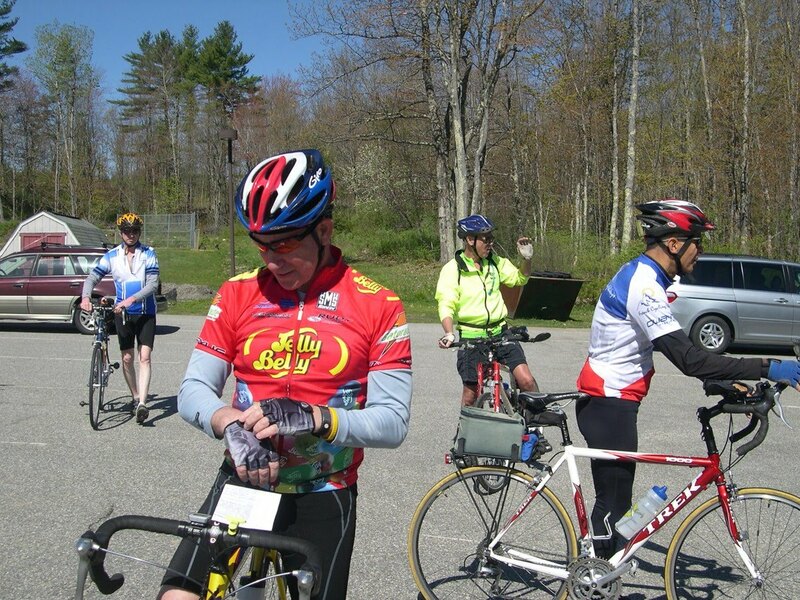 Many thanks to Frank and to all who took part in a sweet ride. Next Saturday's KVBC ride will explore the Belgrade Lakes. The weather forecast is a bit damp, but think positive! More great riding is ahead.